Juan Cristóbal says: – There was a high-profile meeting today at OAS eadquarters in Washington between OAS diplomats and Antonio Ledezma, Pablo Pérez and César Pérez Vivas. 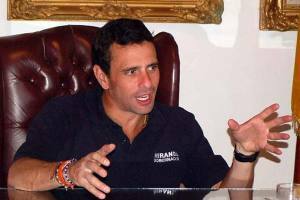 The absence of Henrique Capriles Radonski did not go unnoticed, and several journalists in Venezuela have questioned the Miranda governor’s motives. Wondering what the real story was, I called up my sources close to the Governor, and here is what I found out. Apparently, when Ledezma announced his Washington trip, he did it with no prior notice, no heads-up to the people that were supposedly going to go with him. Capriles was not pleased, although he was not surprised either. Ledezma is known amongst opposition circles as someone who goes off message. Apparently, there was supposed to be a prior meeting to coordinate what was going to be said, but Ledezma ran with it and focused the announcement on his own agenda. While the Capriles people have no problem working with Ledezma, there seems to be a growing sense that Ledezma is taking the “opposition leader” mantle way too seriously. This would not be a problem if Ledezma aligned his priorities with those of the other sectors of the opposition, which is apparently not how it is perceived. For example, one thing my source mentioned was that Ledezma “complains without providing solutions,” and that he gives the OAS “too much importance.” Capriles, for one, doesn’t seem to think going to the OAS is going to solve anything. I should stress that, according to my source, there is fluent communication between the Zulia, Táchira and Miranda governors and the Mayor of Caracas (the governors of Carabobo and Nueva Esparta are sitting on the sidelines). But at the same time, there is some friction. There is a great deal of solidarity between the leaders, and they certainly seem to like each other, but the disagreements on a more strategic level are undeniable. This was evident last week when, for example, Capriles went to visit Ledezma and while he praised him for his courage, he also promptly asked him to desist from his hunger strike. Some people will read this and think that somebody (either Ledezma or Capriles or both) is being childish, putting their own interests first. Other will read this and see the necessary growing pains of an opposition coalition, one in which instances of dialogue cannot be subservient to the priorities of the caudillo-du-jour. One thing is certain though – if Antonio Ledezma really wants to be the opposition’s leader, he is going to have to make a stronger effort in order to pull the team together.